A sixty-year-old family business, run today by the third generation, Koniaris Shoes is a widely acclaimed retail shoe company, known for its perfectly stylish shoe and bag collections of established brands for women, men and children. To refresh and update its already established profile, Comma undertook the revamp of the company's identity and presence, creating a new corporate identity, developing an elegant eCommerce website and managing the company's Facebook community. Designing a brand new, elegant logo was the first step to redefining the company's corporate ID. The "new look" gave the brand a fresh, updated vibe, true to its successful presence in the fashion retail business. Understanding that eCommerce is the future of retail, Koniaris asked our help with creating an efficient and easy to use eCommerce website. We designed and developed a functional eShop that represents perfectly the brand's values, based on the Magento platform. 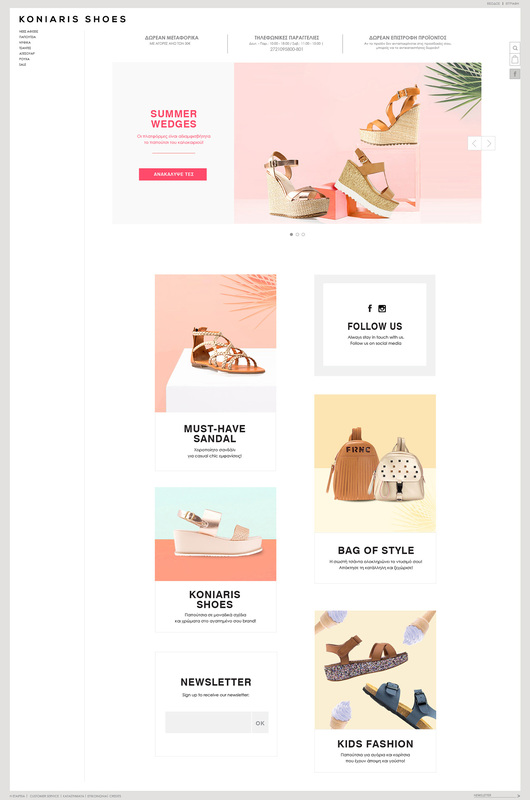 The newsletters we design and develop for Koniaris shoes help not only increase the company's sales, but also enhance the loyalty of its customers, keeping them at the same time informed about all the new arrivals and trends. Creating customized posts that communicate the brand's identity is the cornerstone of our approach to Koniaris' social media management. The goal was to increase traffic and leads in the eCommerce website, without failing to cultivate a personalized relationship with the target audience.